Bowlers Rock Lighthouse – Chesapeake Chapter U.S.L.H.S. Bowlers Rock Lighthouse was built in 1868 on the Rappahannock River 30 miles upriver from the Chesapeake Bay between Bowlers Landing and Suggetts Point in Virginia. It was the only lighthouse built in or on the Rappahannock River. Prior to the lighthouse, two lightships were stationed in the upper part of the river approximately 8-1/2 miles from the town of Tappahannock to mark a rock on the east side of the channel. The first lightship, LV “O”, was stationed from 1835-1861, when it was captured by Confederate forces. The station was vacant from 1861-1863. In 1864, LV-28 was stationed until the lighthouse was first lit on June 10, 1868. 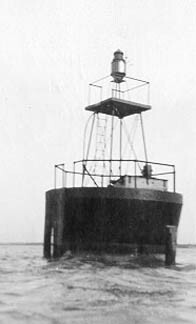 The lighthouse was a white, rectangular screwpile lighthouse with red iron foundation piles standing in six feet of water. It was fitted with a 5thorder lens and Franklin lamp which exhibited a fixed white light. The lighthouse also had two additional fender piles, each set on the ebb and flow sides of the structure for additional stability against the dangerous ice floes. Keepers of the lighthouse had their share of hard luck through the years. In an 1870 inspection report the inspector requested a bigger boat for the station while mentioning that Keeper William Elmore and his wife, Augusta P. Elmore had almost drowned in the small, 14-foot boat. In April 1902, Keeper R. Fuller Bristow was paralyzed on one side of his body while performing duties and was taken to his home to recuperate. In February 17, 1905, with heavy ice on the river, the Keeper made it to shore but, in his attempt, to return to the lighthouse, he was carried far below the station by drifting ice. He eventually made his way back to shore where he left his boat and walked ashore.